There's nothing like having an earthquake advisory appear during the weeks leading up to a vacation near the affected area. For the sake of the millions of people living there, I sincerely hope the San Andreas fault goes back to sleep peacefully. Wouldn't it be wonderful if we could learn how to relieve the stress along fault lines and eradicate earthquakes forever? This week I thought I'd share a photo of something that is very well-traveled-- in more than one meaning of the phrase. 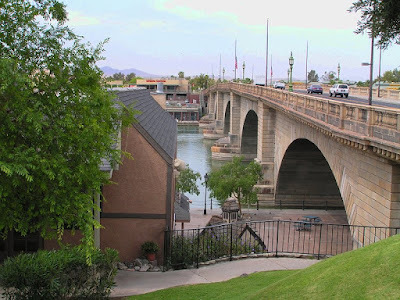 The structure you see to the left is the London Bridge which was dismantled, shipped here to the U.S., and reassembled at Lake Havasu City, Arizona. I think it rather enjoys the weather on this side of the pond. While I wonder what to pack, I'll mosey on out to the corral. 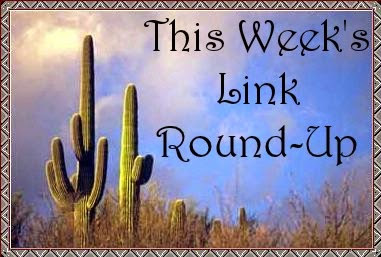 I've been saving some mighty fine links for you this week. Head 'em up! Mooooooooove 'em out! Why crime novels are still popular despite crime levels going down. Thank heavens. James Patterson has called off his fictional Murder of Stephen King. I thought it was a rare lapse of judgement for him. I enjoy watching Outlander, but there's one costume detail that no one notices. What it feels like to be the last generation to remember life before the internet. Crime writer Ian Rankin helped police solve a mystery in Edinburgh. Take a ride on the New York Public Library's book roller coaster. There's a Charlotte Brontë exhibition at the Morgan Library and Museum in New York City. How Stephen King made pop culture weird. How one Amazon Kindle scam made millions of dollars. I told you a while back that Truman Capote's ashes were for sale. Now I now how much they cost. Mysterious Chinese skeletons in an ancient London cemetery are shedding new light on the Roman Empire. Powerful objects from the collections of the Smithsonian's newest museum. Letters from William James-- the only Welshman to fight at the Battle of the Little Bighorn-- have been discovered. A 14,000-year-old campsite in Argentina adds to an archaeological mystery. The forgotten 200-year-old pub discovered under a building site in Manchester, England-- untouched bottles of brandy included! Ancient Roman coins have been found in a ruined Japanese castle. Whatever you do, don't send your robot lawnmower after a moose! Meet Pudding, the photogenic fox that's too friendly to be released into the wild. In a matter of seconds this bobcat lost her family. Now she's getting a new one, thanks to rescuers. Five wild lionesses have grown manes and started acting like males. An amazing breakthrough has solved the mystery of Monarch butterfly migration. A bear in a Polish zoo found a World War II mortar grenade. Twelve of the most beautiful small towns from around the world. The ten strangest places on Earth. The quest to retrace the tracks of seascape painter Childe Hassam (one of my favorite artists). A guide to the real-life homes of the heroes of children's literature. Twenty-four bookshelves that will make any book lover's heart beat faster. Nineteen secrets librarians will never tell you. Ten dodgy lawyers in literature. Eleven things you probably didn't know about Shirley Jackson. Ten fascinating female rulers in history. Ten Dickensian character names deciphered. Nineteen F. Scott Fitzgerald quotes for flappers and philosophers. The jewelry lover's guide to literature. I hope you have a safe trip and that you enjoy yourself, Cathy! As for me, I'm heading to that 200-year-old pub for a pint... Thanks for these great links, as ever. I like the London Bridge photo, and am amazed at its location in Arizona. Who knew? If I traveled to Arizona, I would surely want to visit it. Gosh, that bridge, the Desert Botanical Gardens and the Poisoned Pen are enough to get me there. You won't find any arguments from me!